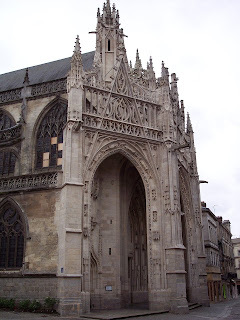 We went to Alencon last Sunday to visit the Fine Arts and Lace Museum. 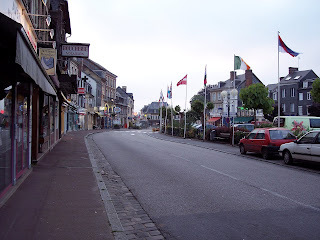 The town was deserted. There were very few people on the streets and maybe two restaurants open. This is definitely not a tourist town. 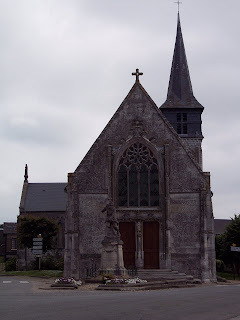 The top picture is one of the church. 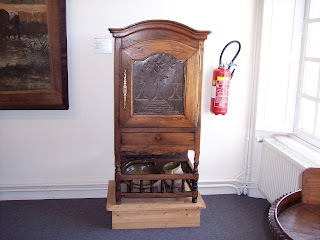 Evidently the front panel is rather rare on it as it shows the Transfiguration. The church is rather pretty. 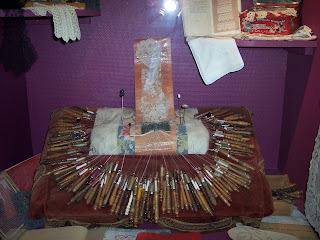 This is the front entrance to the lace museum. 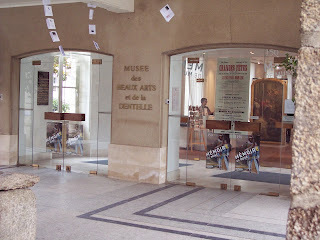 It's also the municipal fine arts museum. No photography allowed inside. The paintings are mainly pre-Impressionist and some are ones I recognized. There's one of Phillip of Orleans that really looked familiar. Another one with night fishing was beautiful. 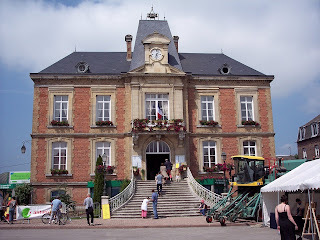 The lace - it was mainly Point d'Alencon and Point d'Argentan. There is an excellent video about lacemaking and several Paco Rabban wedding dresses made with lace from Alencon's lace school. 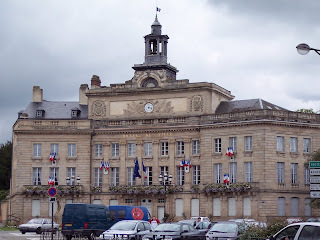 I believe this is the city hall for Alencon. It's just a really beautiful building. This is the entrance courtyard to the fine arts museum. The third band is almost done, as this picture shows. It's a rather large one, considering. I think the next one is smaller. I''m definitely not going to have this done in time to turn in for evaluation, so I'm afraid I've lapsed slightly and let the back of the piece get a little less perfect. My husband will be framing it so the back doesn't show anyway. I do like my color choices and will probably add one or two more colors in blue or green as I go. 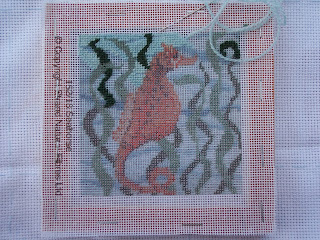 This poor thing gets the least progress because it's not really in the rota, but it's coming along all the same. Maybe I'll finish it in a month or so. 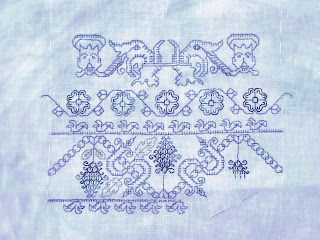 I'll be returning home before my husband in two weeks to do a favor for a friend and this will make a good thing to stitch on the cramped and crowded plane. Still going around the curve of the first corner on this one. Not much progress, but some. I'll get it done eventually. I'm so close to finishing part two of this. 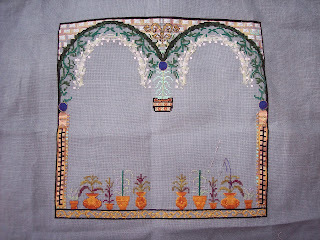 There are Rhodes stitches to put in the bottom part and the second half of the pots to outline. I got some things done this week on it, and hopefully can finish part two of six this week. It'd be a great relief. I've been on part two for a good eight months now. 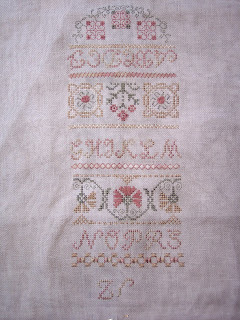 I finished the second of three parts of embroidery on this last week and started on the third and final part. 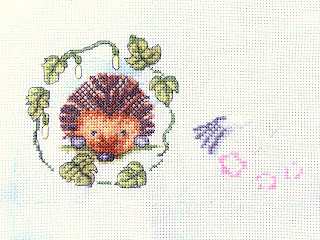 It's coming along well, but I'm really displeased with the lack of customer service of Carol Tinson of Heirloom Embroideries. When we signed up for the class, we were told that we'd have her on a forum to help us and that each part would be mailed on the first of the month. The final part, the part that gives finishing instructions and materials, supposedly was mailed on Thursday instead of June first. There was no communication from Carol for six weeks. She's been pretty much absent during the whole mystery on the boards. I can take neglect. I can even take delays in mailing. What I cannot take is a complete lack of communication as exhibited by this designer. Although I like the design, there are other mysteries out there by other designers who actually inform their customers of hiccups and delays. When she did get onto the boards on Thursday and told us that it was mailed out, her tone was not one of apology but of whining and "poor, pitiful me" type stuff. I don't buy from designers or sign up for classes to have designers treat their businesses as coffee klatches. Not interested, don't care. I will not be purchasing from this designer again. The course, by the way, was prepaid and she was good about communication before it started. I counsel anyone who is interested in doing a course with this designer to think long and hard and know, going in, that there won't be much support and there will probably be delays and possibly even not finishing of the course. 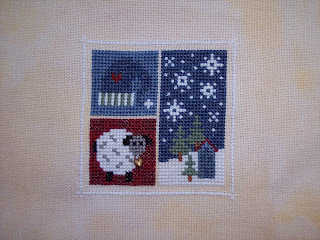 This is my work so far on Vicki's calendar round robin. She did the hedgehog before mailing it to me. 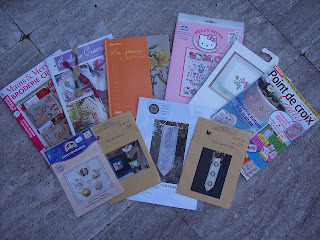 The designs are from World of Cross Stitch magazine, and she's having each of us do one month. My husband thinks the hedgehog's very cute. 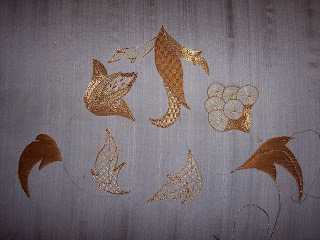 Silk and Metal Done, Done, Done! It's done! I managed to complete this Group Correspondence Course on time. I'll be sending it to Rissa next week. Everyone here loves it. I see some flaws, but I learned a lot. The lower picture was taken yesterday evening before I finished. I just got up this morning and worked on it until about noon. 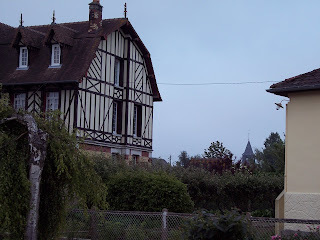 Today's been a rainy day in Normandy, so it was a good day to stay home. 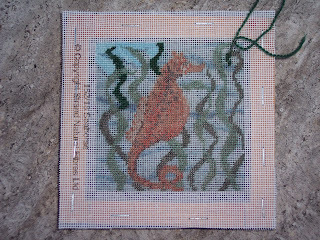 This makes finish number five of my 25 project challenge. I'm so happy it's complete! I'd been feeling (again) like I'd not been making much progress. Since Lynn requested it, here's some of what we saw inside. 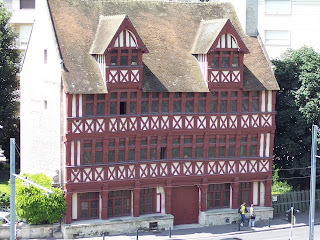 The Normandy Museum isn't an art museum - it documents the life and culture of Normandy. There are a lot of results of archaeological digs and several pieces of farm equipment. 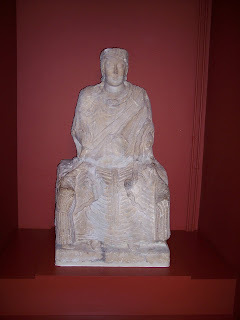 The statue here is a mother goddess from the Gallic era, influenced by Rome ( I think the sign said ~200 BCE). It was in pieces and they put it back together. The lace here is the only piece they had being put together. There are other pieces (a really pretty wedding dress), but this is all I got a picture of. This same room also had a collection of hats - the kinds of hats different villages used. 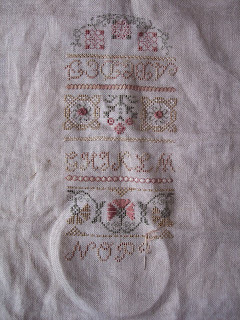 All were very fine cotton voile starched stiff with lace additions. I couldn't imagine why some of the shapes were used, though. One looked almost like a duck sitting on someone's head. My husband loves old furniture, so I took a picture of this for him. 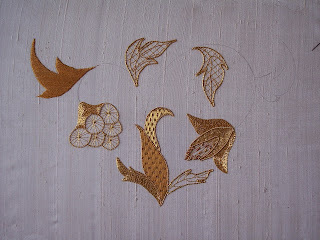 He'll probably incorporate some of this into one of his designs (in his meager spare time, he makes furniture). It's a pretty chest that looks like it was once in a church, possibly to hold the candles. 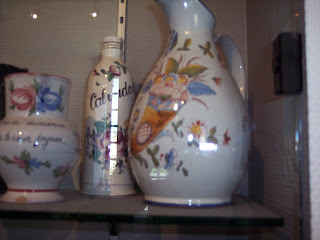 I really liked the design on this cidre jug. 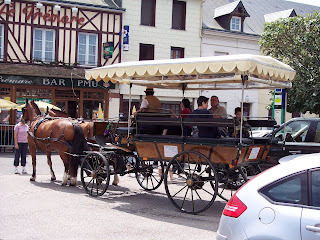 Cidre and calvados are the two drinks of Normandy. Cidre comes in two types - dry an sweet. Sweet tastes like drinking an apple pie. Dry (brut) is better. Calvados is rotgut until it finally starts smoothing out after aging at least oh ... twenty years? 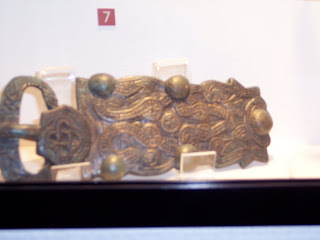 I really liked the design on this GalloRoman brooch dug up in Normandy. I might use its pattern to design something. 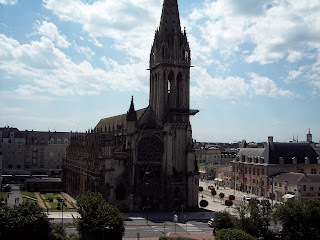 My son and I went to Caen yesterday to the Normandy Museum to work on my Legacy scholarship from the EGA. 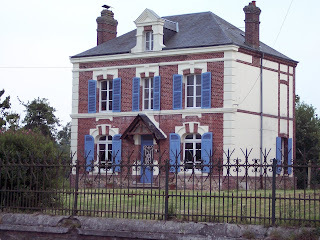 It's in the Ducal Chateau - originally built by William of Normandy (yes, the 1066 William). 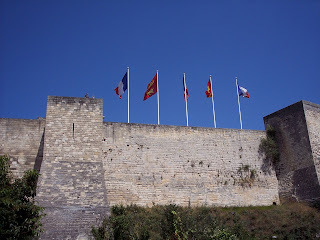 The walls rise about fifty feet above the town center and there are several buildings inside. It was all rebuilt after World War Two. As you can see, the French have a penchant for ignoring handicapped access. 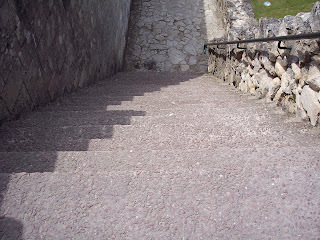 Their stairs are steep and there's no way to get around them. Makes a pretty scary picture! This is the entrance to the chateau area. Rather imposing. I saw this building from the top of the walls and liked the look of it, so I took a picture. 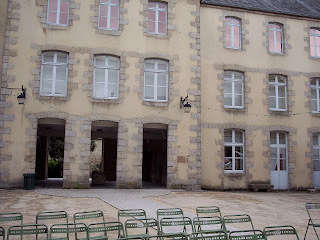 I -think- this is the Abbaye aux Hommes. Whatever it is, it's just across the street from the chateau walls and it caught my interest. I've been able to make some progress on this. The thread feels good in my hands and I like watching the pattern take form. What's better is I haven't had to stitch any with the honeydew until today. The honeydew, to me, is a filling color. It's pretty enough on its own, but the pattern's darker colors are more dominant to me. Someone is already done with part six of this - it's in the yahoogroup photos. It's gorgeous. I still think this color background is the best for it. I'm almost done with this - except I ran out of black beads lastweek. I'm waiting for the ones my daughter sent to me on Thursday in the mail. They should get here some time this week. 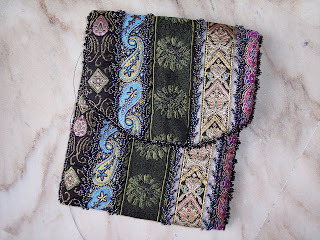 Then, I can finish the purse. It'll be a good thing. I've really liked this project, though. I'll be making more purses and other things with this technique. 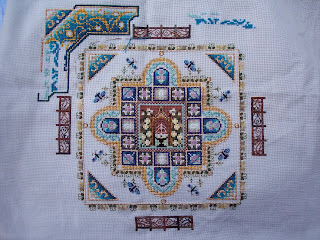 Yes, it's been a while for this one, but I made some progress on it last week. 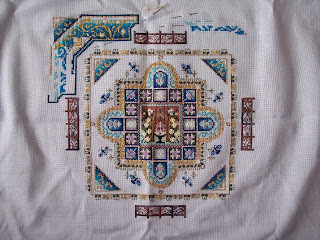 The second corner is more started now and the first corner needs only the downward part filled in. I love working with these colors every time I do. 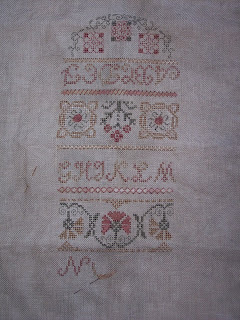 I've managed to stay well under my budget for buying needlework stuff in France so far. Maybe that means I'll splurge before I go. Anyway, these are pictures of what I've bought so far. 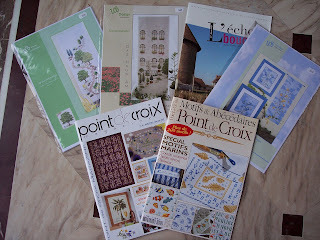 Lots of cross stitch and one magazine that specializes in freestyle embroidery. I'm almost done with the second part of the Huswif Mystery. There's a problem with Carol sending the last part, so I'm kind of catching up with everyone else. Since this picture, I finished the band that's half done and started another. Still liking this, but I'd like to know how to put it together! 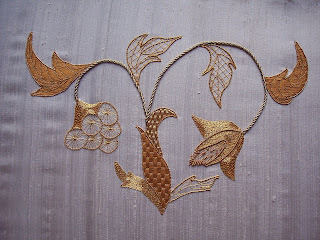 I worked a couple of hours on the goldwork this week and made a lot of progress here in France. I have a really nice table with direct sunlight that I use. It works well. I'm going to try to finish it up next week. I'm so happy it's almost done! The seahorse got some work last week, but not this. It's easy to work on, but I've been kept downstairs doing things while my husband gets ready for bed, so this has been neglected. The whole area between Pont Audemer and Rouen is filled with fields of plants about two and a half feet tall with blue flowers. They're flax! There's even a museum devoted solely to flax in the village these pictures were taking in - Routot. We had a wonderful time on Sunday looking at all the fashions and food and everything else made of flax. There was even farm equipment straight from the fields. 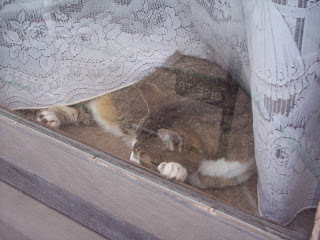 The cat in the top picture was sleeping in the window right near all the hubbub. We thought it was cute. The looms and such were inside the museum, which was open for the festival. 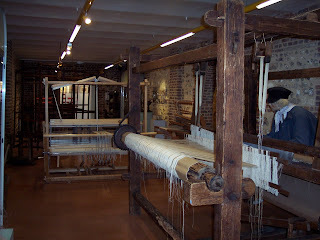 They had several antique looms and a huuuuge warp frame. 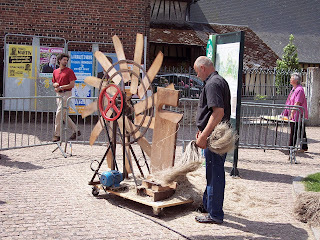 This man was flaying the linen to reveal the fibers for spinning and weaving. I'd never actually seen it done. 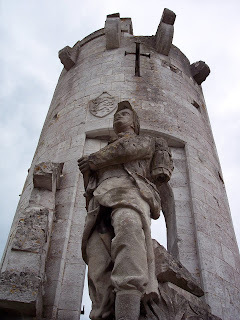 This war memorial is on the hilltop above la Bouille just north of Rouen. 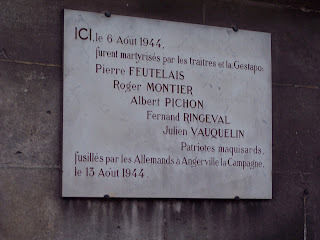 We saw it on our way home from Rouen on Saturday. Anyway, it's not from World War II. 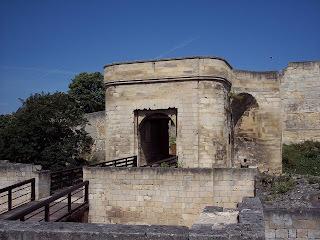 It was originally erected for the Franco-Prussian war and then names were added to it after World War I, when the site was used as a gun emplacement overlooking the Seine. Kind of cool looking, I thought. 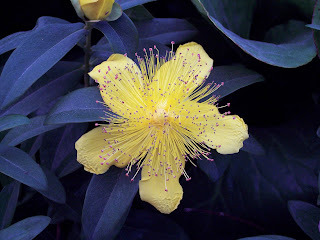 It's been a while since I showed a picture, but this is the Huswif Mystery from Carol Tinson. It's getting there. I think the band I just finished is the last really large one. Maybe I can work on it more this week. Just some flowers by the side of the road on a walk. 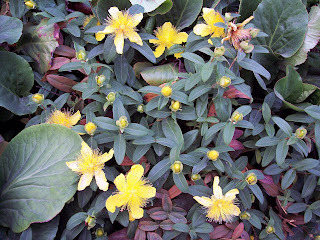 I think the yellow ones are clematis, but they're on bushes instead of vines. Either way, they're pretty. 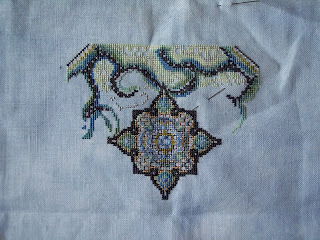 This is what I was working on, stitching-wise, this past week. It's the beginning of a round robin that I need to put in the mail today. 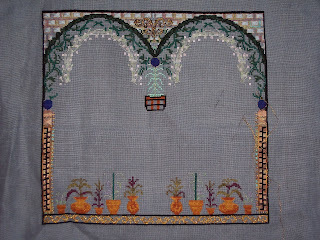 This is the January square from Lizzie Kate's 2003 series. Hopefully all twelve will be done when I get it back. This is more of our walk in Beuzeville. 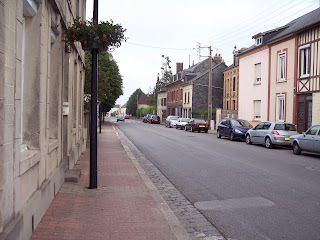 It's the main drag and one of the streets off of it. 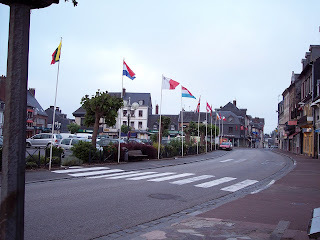 The parking lot with the flags is where the market is held every Tuesday. Town's not too big, but it's got its charm, four bakeries, and about six restaraunts. This is the small town we're closest to. It's about three miles from the chateau. 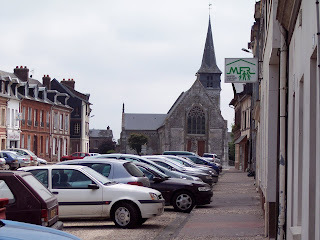 It's a very pretty town and has a lot of services, including about ten restaurants. 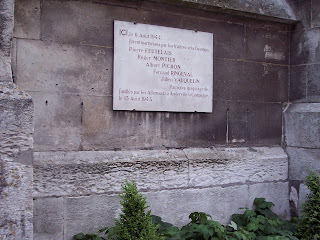 The plaque in the top and second pictures is on the church and is a visible reminder of World War 2. There are a lot of such reminders - the town's graveyard has several Union Jacks still flying, and the commonwealth war graves are still tended. 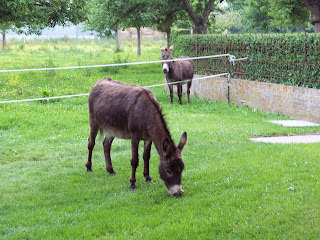 The donkeys were in the middle of town. Did I mention we're in a big agricultural area? Also in the middle of town are cows, miniature horses and chickens. Everything is in backyards. The house below seems deserted and we thought it looked pretty. 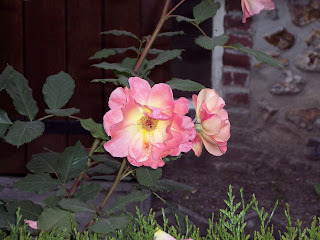 All the main streets have flower baskets on the lampposts. I thought they looked nice. This is looking south in town from just south of the church.